President Moon Jae-in on Monday discussed a response to North Korea's latest nuclear test with French President Emmanuel Macron and Australian Prime Minister Malcolm Turnbull over the phone. Moon told Macron that the test was a grave provocation and on a new level in terms of scale and nature. 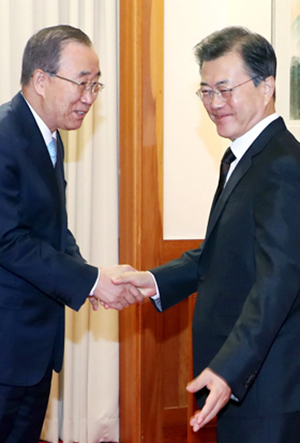 He asked France, a permanent member of the UN Security Council, to play a proactive role in ensuring that a fresh UNSC resolution is adopted and implemented, according to presidential spokesman Park Soo-hyun. He thanked Macron for demanding an emergency UNSC meeting right after the nuclear test and for calling his Chinese counterpart Xi Jinping. Macron said France will continue to work with other countries at the UNSC and welcomes South Korea's efforts to bring the North to a serious dialogue table and impose tougher sanctions at the same time. In the conversation with Turnbull, Moon was quoted as saying that he patiently urged Pyongyang to abandon its nuclear and missile programs but is now persuaded to take "powerful and substantial" measures. The three leaders agreed that "the international community should implement the strongest possible sanctions and pressure Pyongyang to return to the negotiating table," the spokesman added.